SMALL in Excel (Formula, Example) | How to Use SMALL Function? How to Use the SMALL Function in Excel? The Microsoft Excel SMALL Function is the function which is responsible for returning the nth smallest value from the supplied set of values. 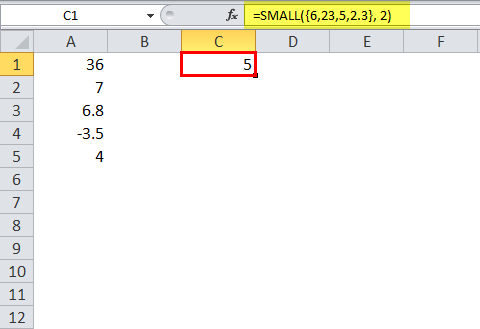 In other words, we can say that SMALL Function in Excel retrieves the “nth smallest” values- like the smallest value, 2nd smallest value, 3rd smallest value etc. 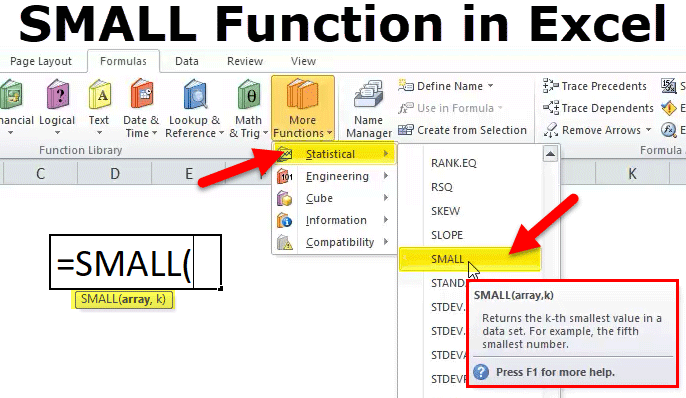 The SMALL Function in Excel is a built-in function of Excel and is categorized as a Statistical Function in excel. As a part of worksheet function in Excel, SMALL Function can also be entered as a part of another formula in a cell of a worksheet. In terms of financial analysis, SMALL Function is very much useful for finding the smallest value in a supplied set of values in Microsoft Excel. For example, if the entire salesman in a company is given the same target, then with the help of SMALL Function, we can find that which person achieved the sales target in the shortest time of the year. Below is the SMALL Formula excel. array – This is the range or array from which you want the function to return the nth smallest value. nth_position – This is an integer which specifies the position from the value which is the smallest, i.e. the nth position. 1. Just enter the desired SMALL in the required cell and you will get a return value on the argument supplied. 2. You can manually open the SMALL formula Excel dialogue box in the spreadsheet and enter the logical values to attain a return value. 3. Consider the screenshot below to see the SMALL function option under the Statistical Function menu. 4. Click on the SMALL option. 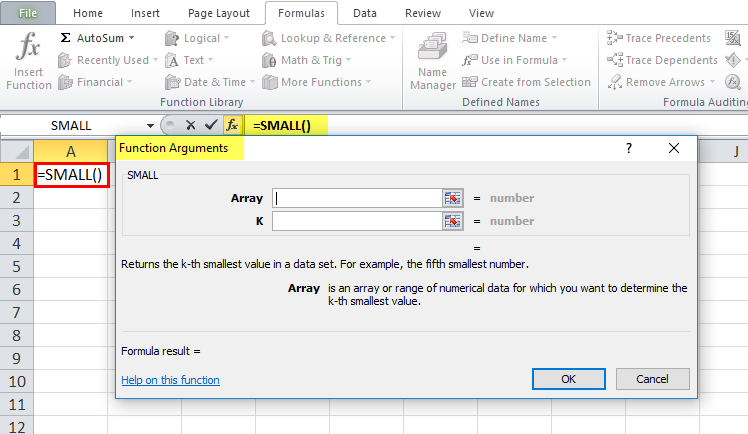 The SMALL formula excel dialogue box will open where you can put the argument values to obtain a return value. The return value will be a numeric value which is the nth smallest value in the array. Please note that if the nth_position is a larger value than the number of values in the array, then the SMALL function will return #NUM! error. If the supplied array is empty, then the SMALL function will be returning #NUM! error. The SMALL Function is a useful function when you are going to retrieve the nth smallest value from the supplied set of data. For example, the SMALL Excel Function can be used to find the first, second or the third lowest scores of a test or the fastest times of a race data. Similar to the LARGE Function, the SMALL Function also retrieves numeric values which are based on their position in a supplied list when they are sorted by value. Please note that Microsoft Excel uses “k” instead of “n”. 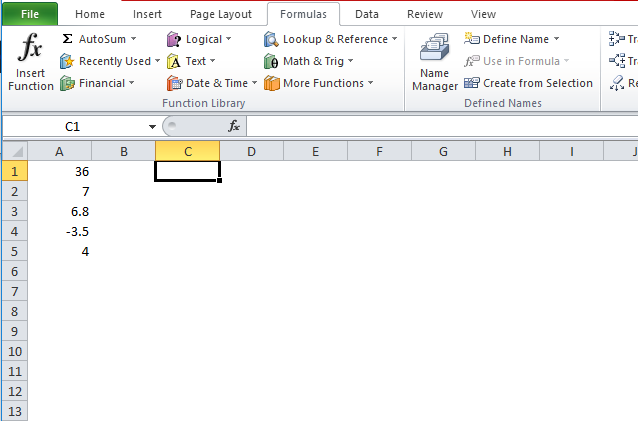 We are using “nth”, because it is much easier to understand the SMALL formula excel and its working. Let’s look below at some of the examples of SMALL function in Excel. 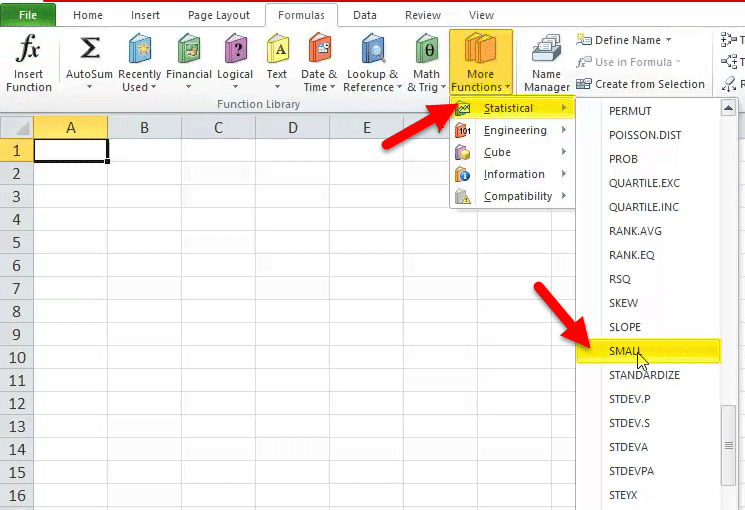 These examples will help you in exploring the use of SMALL Formula Excel. Based on the above SMALL in Excel spreadsheet, let’s consider these examples and see the SMALL function return based on the syntax of the function. 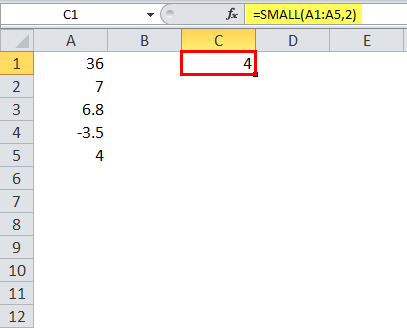 Consider the below screenshots of the above SMALL in Excel examples for clear understanding. One of the most common problems which you can face while you are using the SMALL Function is that it returns the wrong value, or the return value is nothing but an error such as #NUM! error. This error can occur even if the supplied value of k is between 1 and the supplied array value numbers. Possibly, this can arise when you have included text representations of the number within the supplied array. Text values are ignored by the SMALL Function and it only recognizes numerical values. If you face this error, then convert all the array values into numeric values. #NUM! – This kind of error occurs when the supplied value of n is less than the numerical value 1 or greater than the values in the supplied array. Apart from this, this error can also occur if the supplied array is empty. #VALUE! – This kind of error occurs when the supplied n is non-numeric value. 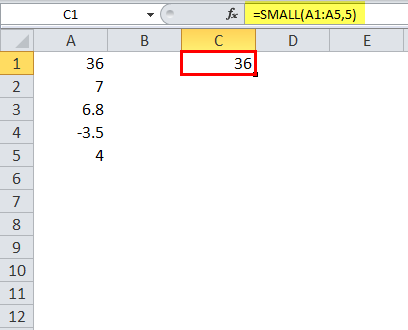 The SMALL in Excel is the function which is responsible for returning the nth smallest value from a given set of values in the spreadsheet. 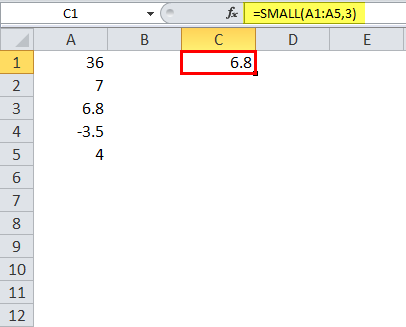 The SMALL in Excel is categorized as a Statistical Function. The function basically returns a numeric value which is totally based on their position in a supplied list of values when sorted. If the supplied array is empty, then the SMALL in Excel will be returning #NUM! error. If the supplied value of n is less than the numerical value 1 or greater than the values in the supplied array, then the SMALL in Excel will be returning #NUM! error. If the supplied value is non-numeric, then the SMALL in Excel will be returning #VALUE! error. How to Highlight Row in Excel?